Having found a perfect place to hide a nest, Mrs Clutterchuck made a soft hollow among the tall grasses and everyday for seven days laid a brown speckly egg in it. But something must have gone wrong with Mrs Clutterchuck’s arithmetic because one day, when she came to sit on these eggs, there were eight of them! Seven were brown and speckly but the eighth was a big pale green-blue egg that had certainly not been there the day before. “I suppose I must have laid it in an Absent Minded Moment”, thought Mrs Clutterchuck as she sat back down on her nest. And there she sat until one day there came a tap-tap-tapping from inside the eggs. As they grew older the little family would play hide-and-seek under the dock leaves and chase each other among the daisies but Quackety could only waddle along, stumbling clumsily among the buttercups. The only place Quackety felt really happy was at the edge of the Brook. He thought that the green shiny water was the most beautiful thing he had ever seen. He liked the feel of wet squishy mud by the water’s edge and the smell of the damp reeds. Mrs Clutterchuck could not understand it and she smacked Quackety whenever he got his feet wet as she was frightened that he might drown. One day, Quackety decided to run away to sea and become a pirate but when he got to the water’s edge, he remembered his mother’s warning about chicks who fell into the water getting drowned and so collected some dry rushes and tied them together with grass stems until he had made quite a big raft for himself. It floated beautifully and Quackety felt very proud of himself as he stepped on board and sailed merrily down the stream. “Now for some piratical adventures” said Quackety. Now it just so happened that Mr Jeremy Tweezle, the water-rat, had brought out all his clothes to give them an airing when Quackety spied Mr Tweezle’s cocked hat hanging on a twig. “Just the thing for a pirate” he cried and snatched it away as he sailed past, not in the least bit sorry for his Disgraceful behaviour. Early next morning a crowd of people had collected at the house of Oswald Toots, the policeman. They had all come to complain about Quackety the Pirate. One after another they told Mr Toots about the Extreme Boldness of Quackety the Pirate and Mr Toots wrote it all down in his Policeman’s notebook. “We must find this dangerous person!” he said when they had all finished. And that is why, when Quackety started back up the Brook next morning he was taken by surprise and arrested. “Quackety” said Oswald Toots “I arrest you in the name of the law.” And he put a chain round poor Quackety’s neck and led him away to prison. Reluctantly, Professor Fluster Whuffle released Quackety and told him to find Master Pumeloe, the black pig from Little Trodger’s Farm. “Pray tell him to hurry as our case is urgent.” Eventually Master Pumeloe was seen punting up the brook towards Hollow Willow. The water was right up round the foot of the tree and everyone was very relieved to see him. Master Pumeloe took them all on board and poled them across to Potter Pinner Meadow and safety. As for Quackety, he was forgiven all his Badness because of the way he fetched help. 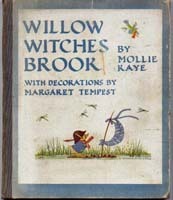 Mrs Cluttercluck and the seven little chicks have gone back to live in the farmyard, but Quackety preferred to stay near Willow Witches Brook. He has a little house of his own among the rushes and spends most of his time swimming. You see Quackety is really… a duck.